Preheat oven to 375°F. In a large mixing bowl, beat together softened cream cheese and sugar until smooth. Add eggs one at a time, mixing well. Add sour cream, lemon zest and vanilla, mixing until well combined. Pour into two 8-inch ready-made graham cracker pie shells. Bake for 10 minutes. 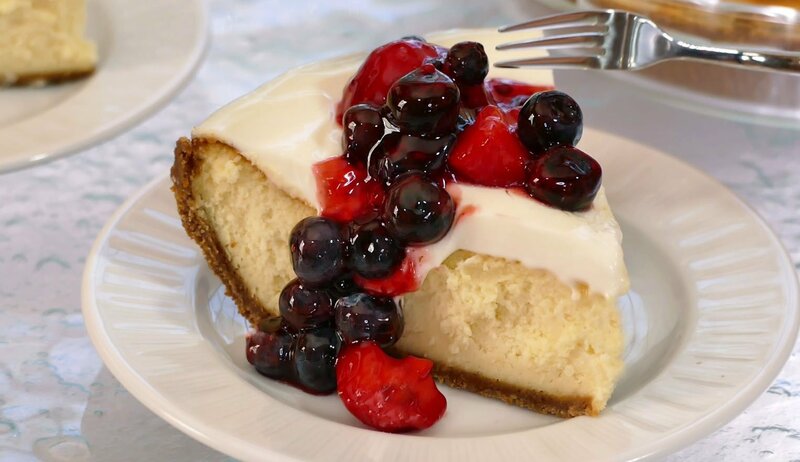 Without removing cheesecakes from oven, reduce oven temperature to 250°F and bake for about 70 minutes (1 hour and 10 minutes). Cheesecake is done when toothpick comes up clean. Allow cheese cakes to cool. Meanwhile, make cheesecake topping. In a bowl, whisk or beat together sour cream, sugar, lemon and salt until smooth and creamy. When cheesecake has completely cooled, spread topping evenly over cakes. Bake at 350°F for 10 minutes. Refrigerate for several hours or overnight. Gently mix together fresh berries and half of the container of Marie's Glaze for Strawberries. Pour over finished cheesecake and serve chilled or room temperature.